July 28th, 2016 – Middelharnis, The Netherlands – OPNsense is a fast-growing open source firewall and security platform released under an Open Source Initiative approved license. 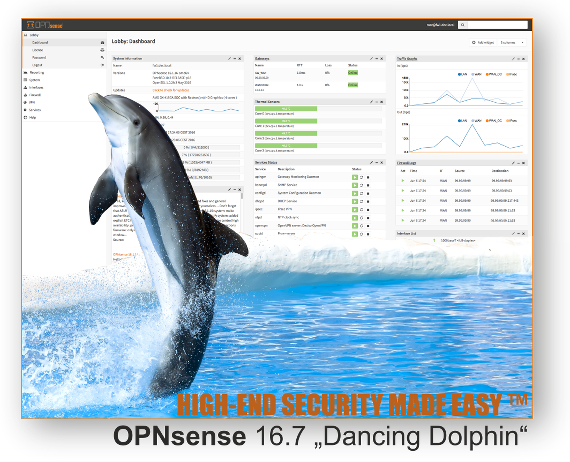 Deciso announces the immediate availability of version 16.7 named “Dancing Dolphin”. Since the previous major release, its impressive feature set has been expanded with category based web filtering, two-factor authentication (2FA), built-in bandwidth monitoring, netflow exporter, ICAP support and a high-performance load balancer plugin based upon HAProxy. A new pattern-matching library called Hyperscan was introduced to dramatically improve the performance of the Intrusion Prevention System. The user experience has been improved for all visible GUI pages including a completely revamped dashboard with multi-column and drag & drop support. At the same time multi-language support has been extended with the completion of Japanese and Russian. For developers the RESTful API has been extended, new development tools made available and a pluggable infrastructure was added for services, syslog and interfaces. OPNsense 16.7 is equipped with a reliable and secure update mechanism to provide weekly security updates. The latest release is based upon FreeBSD 10.3 for long-term support and includes HardenedBSD’s ASLR implementation enhancing the base systems protection against buffer overflow attacks. Deciso is the company that founded the OPNsense project and offers turnkey solutions as well as commercial support and oem services.